If more people would just be a little bit braver and do the right thing and give their unwanted animals directly to the rescuers, it would be so much better, this poor little pup was left, we wonder if the person was ashamed? Taking a break from his work at the time, Eddie Olivarez worked at Albertsons, a grocery store in Arcadia, California, he found the little pup. 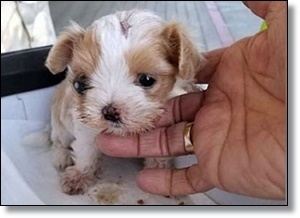 But his senses took over and he realized that the box had to be opened, and sure enough there was something incredible inside a one pound pup desperately in need of help!